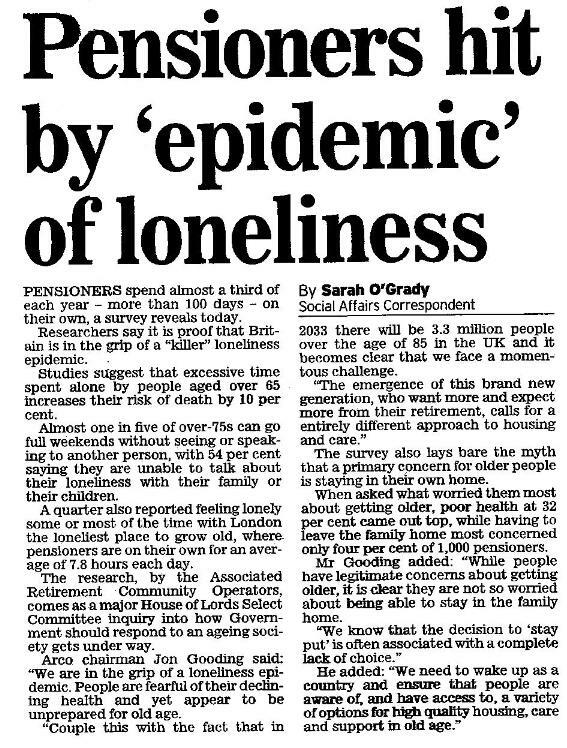 An article in the 11 March 2013 edition of the Daily Express, reproduced below, has highlighted an issue Carers Direct is all to familiar with, which is the elderly are becoming increasingly lonely in their own homes. At Carers Direct, we are unsurprised by the findings published in this article. This is the reason we are at pains to explain that our services must go beyond dealing with issues purely relating to health. We are constantly reviewing the situation with each of our service users to see what can be done to assist with hobbies, attending clubs, the theatre or even the local pub as we see loneliness as a major issue that must be tackled head on.